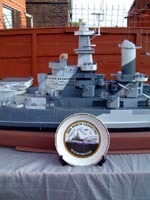 Ron sends in photos of another fine model, this time a 1/40 scale scratch built HMS RESOLVE . She was an admiralty tug built in 1918 for the Royal Navy. 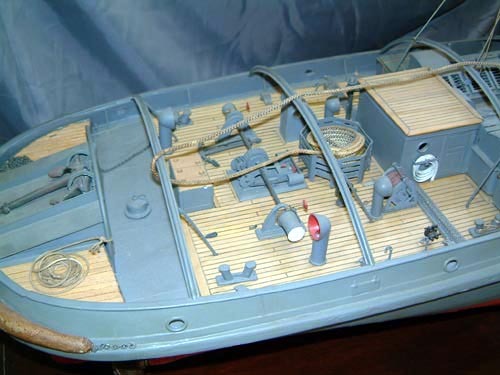 The tug is painted in north atlantic grey. Her job was to take battleships up to Scapa Flow. 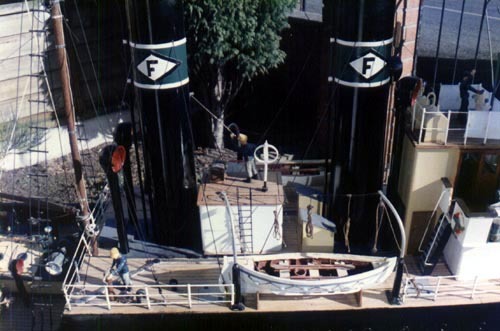 Resolve was one of the most powerful tugs for about 22 years, until the Bustler Class came on the scene. 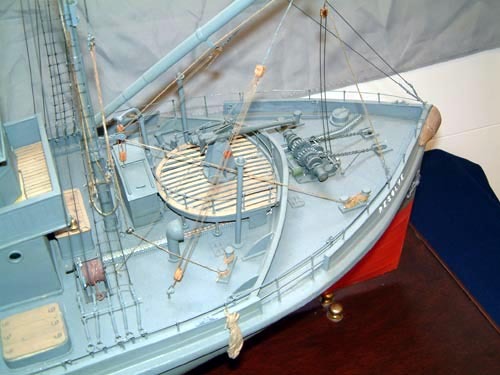 The model took over two years to build, is radio controlled, twin screw ,single rudder. Length is 57 inches, beam 13 inches and draft is 4 inches. 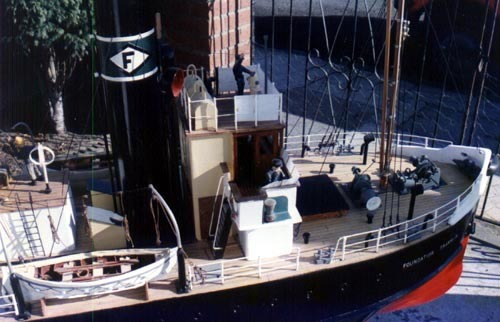 For anyone who has read the classic book The Grey Seas Under, by Farely Mowat, the name Foundation Franklin will be etched in your mind. 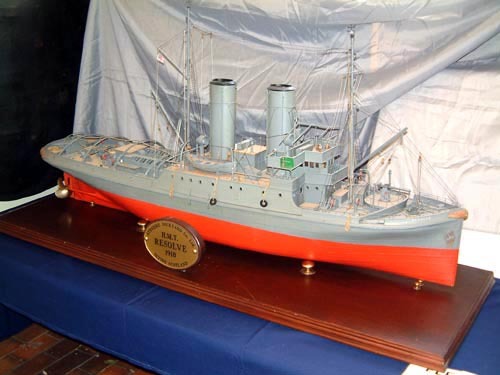 This heroic tug saved countless ships and lives and served in two World Wars. 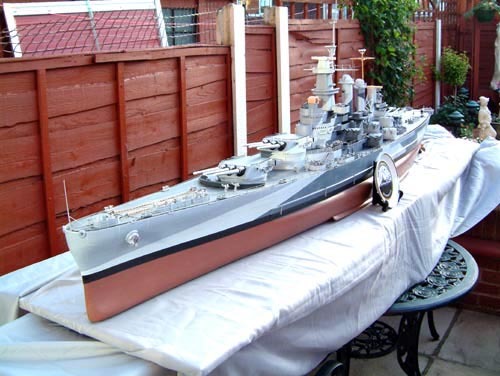 Ron scratchbuilt her in 1/24 scale, resulting in a very large model - 70 inches long, with a beam 13 1/2 inch and a draft of 6 inches. For those who have a tough time getting in a few hours sailing without a breakdown (and this includes me...<g>), consider this - Ron ran her for 24 hours, covering 31 miles in the process! Ron sends in another fine model, this time one of the US Fast Battleships built just prior to it's entry into World War II. 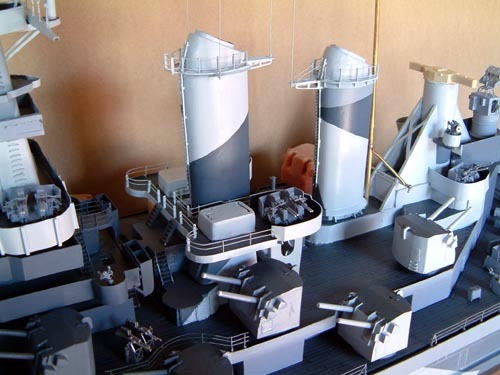 This model is at the 2 year point in its construction, and Ron estimates it will take at least another year to finish her. 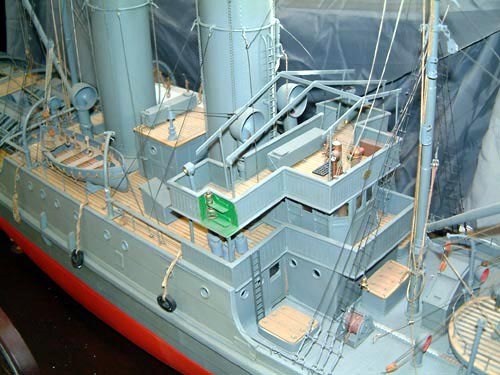 In 1/8" = 1 foot scale, the miniature dreadnought is 91 inches long, with a beam of 13 inches. 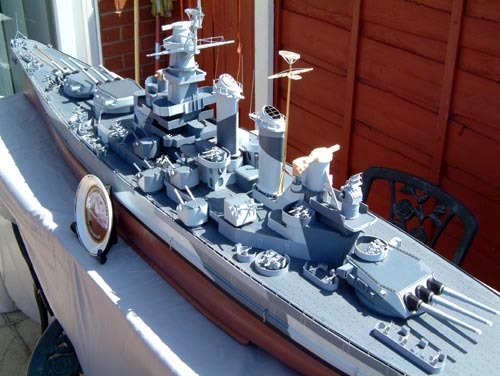 She is mostly scratch built, with a few purhased items, like the tertiary armament. Ron used a combination of his own photos, taken last year on a trip to the Carolinas, and SeaPhoto photo sets to help document the ship. Thanks Ron! 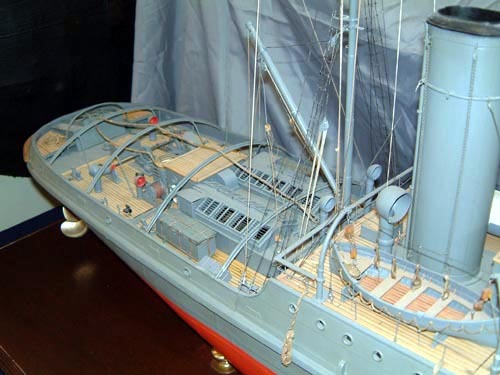 Eric has been working on this model of a Perry Class frigate for a couple of years, and says it is about 99% done. 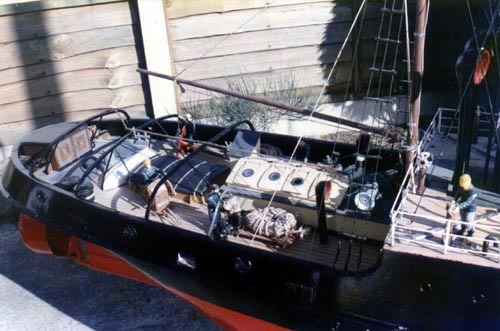 It uses a Scale Shipayrd hull and parts.